is made of the locally available wood named Anogeissus and without cutting a single tree. 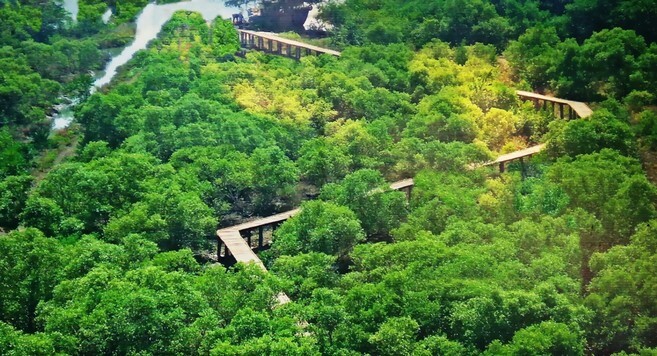 The old Boardwalk is 0.572kms.The Boardwalk is 4 feet above the ground, so that tourist will enjoy the wellness of Mangroves without touching the ground. Coringa Wildlife Sanctuary is the second largest stretch of mangrove forests after the Sunderbans in west bengal, with 24 mangrove tree species, flaunting a unique ecosystem, flora and fauna, rare mangrove species, as also otter, fishing cat, sea turtles etc. The sanctuary has over 200 species of birds, of which 95 are migratory birds from Eastern Europe, Central and North Asia, flying in through the Central Asian Flyway. Close to 78,000 to 88,000 water birds and 21 threatened bird species are located in the sanctuary, known also as a ‘marine protected’ area. Hope Island and Sacramenteo regions are important nesting sites for globally threatened Olive Ridley turtles and green turtles and also a viable site for over 200 breeding fin and shell fish species. Kakinada's Bay of Bengal coastline having become a safe nesting centre, what with the Forest Department and the East Godavari Riverine Estuarine Eco-system Foundation (EGREE), a UNDP-GOI-Go AP and GoMEF project, having jointly taken up conservation methods that account for targetable progress. During high tides, water enters the entire Boardwalk area and the tourist feels like as if they are walking on the water. This is particularly more enjoyable on Full Moon day(Poornima) and No moon day (Amavasya). While walking on the Board, tourists can see Wildlife Creatures like Yellow Fediler craps, Mud Skipper, Some Molluscans. Apart from Ignits, Egren, Horam, Mynas, Ibiss, Storks, if the tourist is really lucky he can see Fishing Cat, The Golden Jackal and also otters. Boating is a way to see Coringa Wildlife Sanctuary at its best-with the birds and animals. Tourists can take the boat journey from boarding point to the mouth of the sea or can opt for Mangrove creep ride. Located amidst the mangroves, the lighthouse at Coringa, one of the oldest in the country, is in a dilapidated condition. The lighthouse has been abandoned for years. Once known as "Cape Cori", Coringa was built by the British way back in 1759 and attained fame internationally for ship building, repairs and maritime trade. 40 Meter High Watch Tower provides an excellent birds eye view of the Corijnga Wildlife Sanctuary. 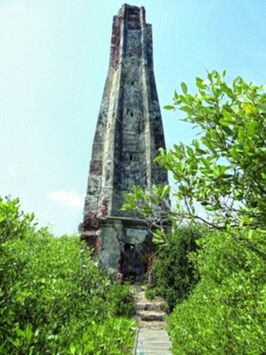 Climb it and get excellent view of the dens Mangrove Forest. You can sight the unique Mud Skippers. Mud Skippers are intresting animals and are called as the Living Fossles i.e.the connecting link betwwen the fish and the amphibians. Macha the Fishing Cat, the official mascot for Coringa Wildlife Sanctuary in Andhra Pradesh. Coringa is one of India's largest contiguous stretch of mangrove forests and hosts the largest population of Fishing Cats in the country. Macha the Fishing Cat proudly endorses Coringa to visitors as a life-size sculpture! By Air: Rajahmundry is the nearest airport. It has direct flights from the major cities and connecting flight from others. From Rajahmundry to Coringa, cabs can be hired, the drive would take anything between 1-2 hours. By Rail: Kakinada is the nearest railway station about 20 kms away from Coringa. Taxis and state buses are available to the sanctuary. By Road: Coringa is at a distance of 15 kms from Kakinada and 70 kms from Rajahmundry. Local cabs and buses are available to travel to and fro from the wildlife sanctuary. From Hyderabad its an overnight journey by train or bus. Has a distance of 520 Kms the drive would take 8 hours. October to June is best time, but can be visited any time to Reconnect with Nature. Some of the wildlife found in the wildlife sanctuary is Otter, Jackal, Estuarine, Crocodile and Fishing Cat. The avian population of the Coringa Wildlife Sanctuary includes Snipes, Ducks, Flamingos and Sea Gulls. The sanctuary nests the olive ridley sea turtle in the month from January to March. Rare species of plants, trees, shrubs and herbs are also find inside the sanctuary. 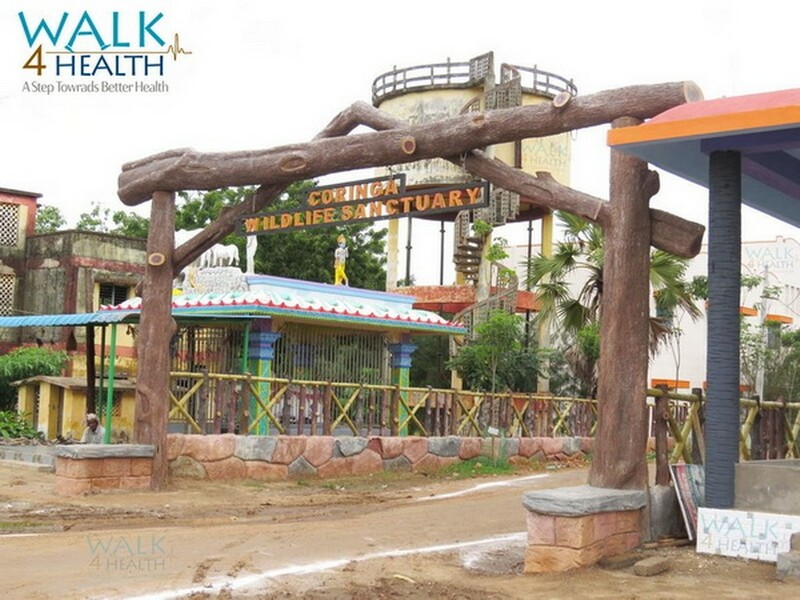 Board Walk, Boat Rides, Jungle Safari, Bird Watching, Kids Play Zone are some of the activities tourists can engage here. The nearest town from Coringa is Kakinada having the best Hotels available at acceptable pricing. Coringa Wildlife Sanctuary, Andhra Pradesh provides Accommodation near Coringa. AP Tourism also has Haritha Beach Resorts, near Kakinada is an ideal retreat for tourists who intend to explore East Godavari. The beach resorts is a boon that offers tourists visiting Kakinada beach a perfect place for quality accommodation, food as well as boating facilities at the resort's doorstep which makes it a trip to remember. Note: Visitors are requested not to carry any Plastic Bags or Plastic Bottles at Coringa as they pollute the environment. Visitors should come prepared with full protection from Mosquitos while walking on Board as the place has plenty of mosquitos. Welcome to Coringa Wild Life Sanctuary, Andhra Pradesh, India.